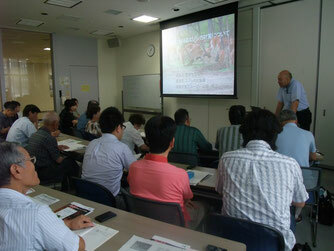 ◇◆◇Study meeting report in 2014◇◆◇ - "Hokkaido Venison Promoting Club"
■"The damage caused by Yezo deer and the effective use of them"
On 15th July, we learned "The damage caused by yezo deer and the effective use of them" from Kouji Yamada and Taichi Nabata, officers of yezo deer countermeasures, life and environment department of Hokkaido Government, as a lecturer. "The habits of Yezo deer" High breeding rate of them Current (2013) populations is 590 thousand.They are polygamous, conception rate is 90%. A two year old deer can give birth to fawn. So, the number of deer born in the next year becomes same even if we capture male deer. "The damage caused by yezo deer" Current (2013) damage of agriculture is \6,400 million (＄64 million), twice as much as the damage in 2012.Most of these damage is "grass pasture". But, these matters are the tip of an iceberg. Invisible economic loss is large, for example, they have begun to eat rare alpine plants(these will not grow again if those gene disappeared), an accident between a train(or a car) and a deer!! "Lack of a new hunter" The number of hunters, role of Yezo deer's number adjustment, are decreasing year by year, on one side of increasing agriculture and forestry damage caused by Yezo deer. The hunting registrant is reduced to half, 20,620 (in 1978) ⇒ 8,305 people (in2012). In addition, the aging of hunter population is progressesing, half of their age are more than 60 generations. "Effective use of yezo deer" Venison have superior nourishment properties, including the anemia improvement effect, such as "High protein, low fat and abundant iron" exceeding to beef and pork. However, in the present state, only a 10% of the hunted Yezo deer is handled in slaughter facilities as venison. It is important that we utilize Yezo deer, as local dishes of Hokkaido, from the viewpoint of stimulating the economy of Hokkaido. 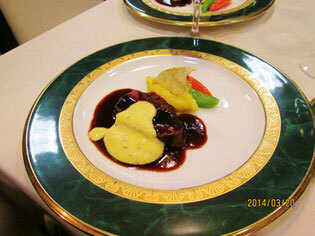 Hokkaido Prefectural Government is establishing some policy so that Hokkaido people can eat a venison safety. By the processes from hunting out of subject of examination to a slaughterhouse, they devise "The Yezo deer hygiene processing manual" so far, and the way plans safe security of the Yezo deer meat as the meal to be able to eat Yezo deer meat sanitarily. However, there are some problems in order to use Yezo deer effectively such as meat and leather products. First of all, it is difficult to sale the venison systematically because there occurs the unevenness of quality depending on the capture situation and season. Secondly, Yezo deer has less quantity of the meat per one, in comparison with cow and pig. "The practice case that Hokkaido Government enforces for the consumption expansion of Yezo deer meat" ⅰ）They set fourth Tuesday every month as "The day of eating venison" to let many people in Hokkaido feel friendly to Yezo deer meat. Specifically, the venison processed in certification system in a participation registration are sold in 249 stores on "The day of eating venison". 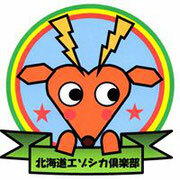 ⅱ）Enforcement of "The Yezo deer dish contest in Hokkaido" It is held for the concerned person such as chef in order to spread the charm of Yezo deer meat. 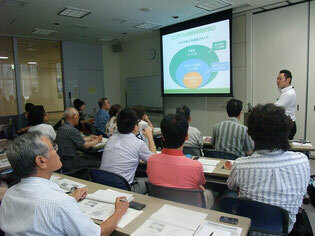 It was held on January 29 last year.